In our fast-paced, sensory-overloaded modern world, the ability to multitask seems like an essential skill if you want to survive and thrive. Juggling multiple ideas, tasks, conversations and streams of attention has been considered an invaluable skill for professionals for many years, but has it all been a hoax? Can human beings actually divide their attention and take care of two things at once? What about three or four? Is it truly possible to multitask? Short Answer: No, and if it seems like you can, that’s just your brain working quickly… but not working on two things at the same time. To put it plainly, multitasking is scientifically impossible, because that simply isn’t how our brains were designed to work. Our prefrontal cortex is the control center of the brain when we attempt to focus on something. Linked to both halves of the brain, it coordinates other areas of the brain that are necessary for attention and the achievement of set goals. With the massive amount of computing power in our brain, it is natural to assume that the cortex can independently handle two tasks, but that isn’t the case. When you attempt to tackle more than one task, it may seem like you are focusing on two, three or four things at once, but in fact, the brain is just shifting focus extremely rapidly. For a healthy brain, this shift can happen almost instantaneously, leading people to believe that they are juggling numerous tasks, when in fact, people are just changing the focal point for the brain in a matter of milliseconds. There are actually two stages to the act of focusing, both controlled by the cortex: goal-shifting and rule activation. The first stage is the actual shift in focus from one activity to the next, which happens very quickly. The second stage, rule activation, is where things can get complicated, as the brain needs to move away from the “rules” required to complete one task (e.g., driving, eating, walking, talking) and then gather the rules required for the next task before continuing. Gathering the necessary information or data regarding the new task may take a long time, particularly as we get older, so re-setting for that second task is actually quite inefficient. The problem with this quick shifting, as it turns out, is that interrupting the cognitive process of attention and focus does have a cost. Research in this field has been extensive, and has found that attempting to do more than one thing at once usually results in more mistakes and a slower total time for goal achievement than if a person had fully completed one task before moving onto the next. Although these shifts of attention only take milliseconds, that time does add up, and taxes the brain. Is This A Standard Struggle? The doubters reading this article may already be formulating their rebuttals, suggesting that they can walk down the street, chew gum, talk on the phone and admire the scenery all at the same time, and they aren’t technically wrong. There are certain tasks and behaviors that our body performs nearly automatically. The inability to multitask mainly applies to high-level brain functions, or else no one would be able to eat a sandwich and watch television at the same time. Our autonomic nervous system and less critical brain areas control many of these basic actions, and this apparent “multitasking” may seem easy, particularly if the tasks are very different (e.g., chewing with your mouth and watching television with your eyes). However, try reading a book and holding a conversation with someone at the same time, and you’ll begin to understand where multitasking breaks down. Since both of those activities require the same part of the brain (language and word processing), the prefrontal cortex can’t handle both requests at the same time. This explanation is beginning to make our brain sound like a rather simple, methodical machine, but there is far more depth to this subject. There are many shades of grey to our executive processes and the brain’s control center, as it allows us to prioritize what consumes our attention. We are able to consciously ignore certain distractions, such as tuning out other voices in a loud bar or narrowing our vision to a single point, rather than being overwhelmed by the constant flood of auditory and visual information from our surroundings. 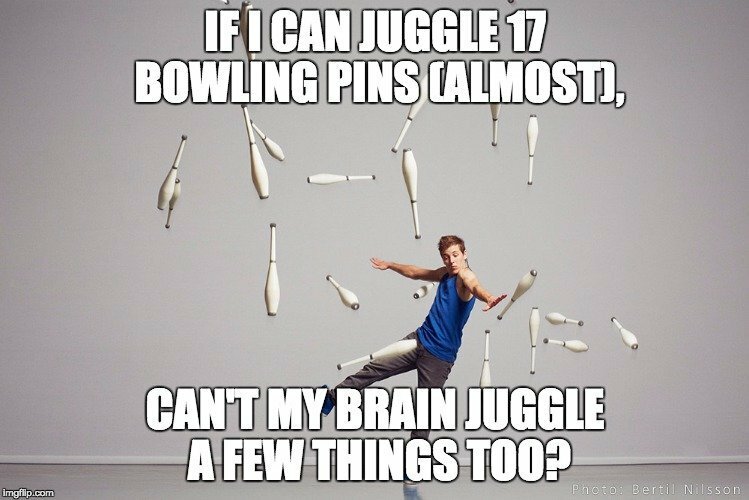 In other words, don’t think of your brain as a broken tool that can’t juggle multiple things at once; it’s pretty darn incredible, and you probably take it for granted! Is There Any Hope For Improvement? While multitasking as a common practice has largely been debunked based on our brain’s fundamental functions, some studies have shown slight contradictions. For example, in certain dual-task situations that require disparate parts of the brain, the right and left lobes of the brain are both activated, but neither have the complete power of the brain behind them. The number of errors that the research subjects made were significantly increased during these brain-splitting moments, and the rapid shifting of attention between the lobes made it difficult to definitively pinpoint true “multitasking”. Furthermore, when a third task was added to the mix, subject performance declined rapidly, and one of the tasks was commonly ignored or completely botched. This study was controversial in its conclusions, but it does offer another perspective. However, what good is multitasking if it can only apply to simple tasks that will likely be performed imperfectly? 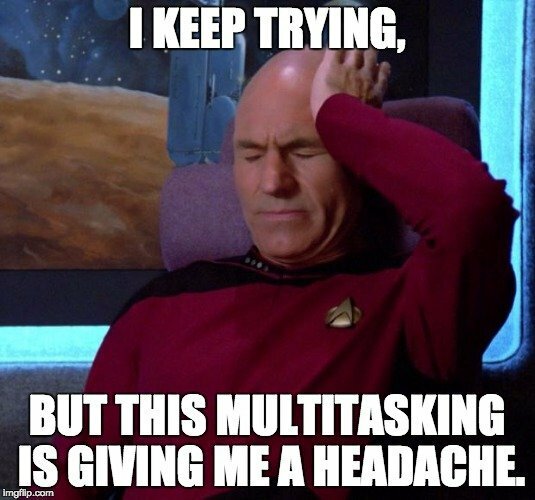 Many experts believe that trying to multitask is actually damaging to the brain’s ability to focus and maintain attention on a single subject. The more you try to become a multitasker, the more likely it is that your brain will try to take in too much information, take on too many tasks, and not perform any of them particularly well. In other words, try to take things one at a time and give your brain a break… you’ll be better off in the long run!